Yay! 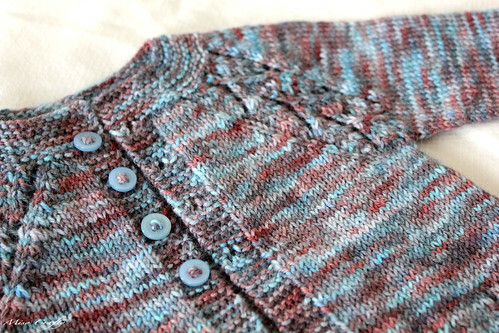 I can finally show you the very first baby sweater that I had knit for one of the babies that will soon be born in the coming months. I've never knit a baby item before and wasn't quite sure what to expect, other than for it to be a somewhat faster knit. For the record, WOW! What an utterly satisfying knit!! Not only can it take just a mere few days to knit up, but in the end you have an entire cardigan done. Yes, yes, I know...it's for a baby and therefore is a wee little garment. But still. It's satisfying cause you've knit up a garment in a few days! How awesome does that feel?? Yeah, mighty awesome. And you know what makes this pure awesome sauce?? This project counts towards my 12 in 2011 goal cause the pattern was free and I've had this yarn in the stash since last summer. Ooohhh yeahh!! I did run into a few problems though. The pattern wasn't originally written specifically for other knitters to peruse. The designer (the talented Nikki Van De Car, who's blog you can check out here) had wanted something special for her little bundle of joy and so designed this sweater with not only love, but with a background story to it. She had such a fantastic response to the design when she was done that she was generous enough to share it with the rest of the knitting world via her blog. Now, there's absolutely nothing wrong with her pattern, but you definitely do need previous knowledge of how to knit up a seamless cardigan from the bottom up. And if you want a different size from what is given (there's only one size) then you need to figure that one out yourself. The pattern isn't broken down as to what section is what, other than the sleeves, and no stitch counts are given. If you do have sweater knitting experience then this pattern will be easy peasy. My problem wasn't with the pattern, but more like I didn't bother to count my stitches after joining the sleeves and starting the yoke. I know, I know...what a rookie mistake! But get this, I was almost ready to start the neck band before I realized that my stitch counts were off! Way off. I should've known quite a few rows back that they were off but I was totally in knitter's denial and just wanted to get the project done. When the realization finally hit me I was really hoping that I could just fudge it all, but on a garment so tiny I could tell that fudging it would be completely noticeable. Darn. This was reinforced by my friend Jennifer, who bluntly (and lovingly) told me that fudging was not an option here. Double darn. So I ripped back to where I joined the sleeves and discovered that the yarn I used doesn't like to be ripped. This was my first time knitting with Araucania and I have to say that really like how define and clean the stitches look, and how it's not splitty at all. The yarn itself is a bit on the thinner side and I did find that it’s quite a “sticky” yarn and doesn’t like to be ripped back without taking bits of fiber with it. I got fed up with the yarn and decided to start a new Maile with a different yarn to see where I could have gone wrong, just in case I needed to keep knitting and ripping and I wanted a smoother yarn to do that with. 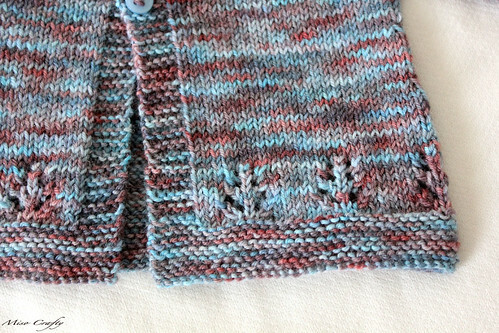 With the second Maile sweater I discovered that had I counted my stitches in the first place after I had joined the sleeves to the body, then I would have known that I was only off by 2 stitches at one of the sleeves!! I don’t know if it was knitter error of me putting a stitch marker in the wrong spot or if the pattern is wrong in telling you were to put it, but I got it wrong twice by following the pattern to a T.
Anyhoo, I had originally knit the sleeves flat, thinking that they are so small that sewing them up wouldn't be that much of a hassle. Yeah, who was I trying to kid?? I hate sewing up knitted pieces!! So why was I trying to convince myself that this was any different?? Call me crazy but I decided to re-do the sleeves and work them Magic Loop styles in the round. Oh yeah...sooo much nicer, quicker, AND would be less irritating for a baby to have a seam there. Knowing my luck, it would’ve been a bulky seam at that! 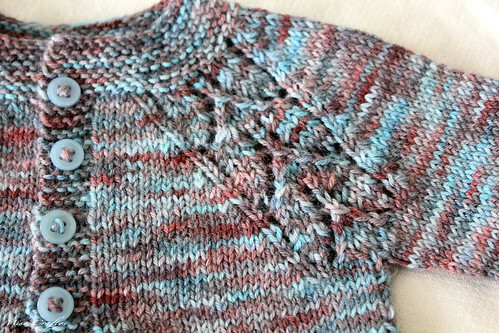 Once I got the sleeves done and everything was back on track, the rest of the knitting went by quick as lightning. I can't say that for the blocking process though, cause that took me forever to do! Don't know why since it's such a small sweater and doesn't require any pinning. Oh yeah. I forgot. I'm lazy. I really hope that Natalie likes this little number and that her wee one can get lots of wear out it! oh my goodness that is so adorable! 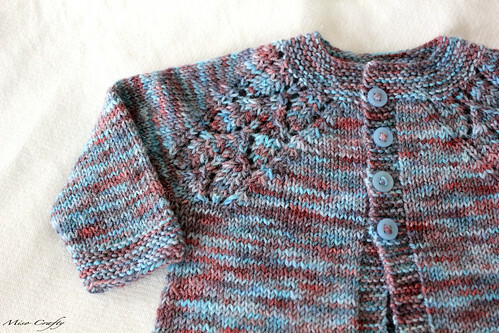 I am going to knit up a toddler vest next to enter into our local show. I can't wait! Ooohh...I can't wait to see your vest! 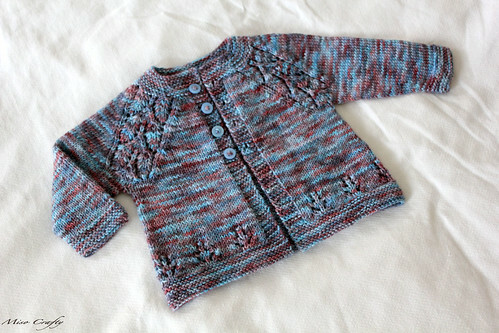 Kids clothing is so much fun and satisfying to knit! Hope you like knitting up your vest!! Thanks so much Shannon! :) I think this is my new go-to baby pattern! Easy peasy and cute to boot!